Over the past 4 months, Steel City Endurance athlete Hadar Aviram has been training to attempt the Tampo Bay Marathon Swim, a 24 mile swim event held annually in Tampa Bay. Hadar, a 39 year old former military defense attorney who currently works as a professor of law at Hastings College in San Francisco has been swimming open water since 2008, has swum several 10k Swim events and to date her longest swim prior to the Tampa bay event was the Portland Birdge swim at 11 miles. Head coach Suzanne Atkinson created her master training plan based on Hadar’s previous & current swim history & volume and the anticipated stress of the event. Consulting with experienced open water & marathon swimmers Terry Laughlin & Darren Miller ensured we were on a good track. If you are a skimmer, here are her highlights, but please enjoy the full report. Three Motorboats sank due to the weather conditions. SANK! She had an absolute blast despite the conditions. Only 6 of 18 solo swimmers finished the race. 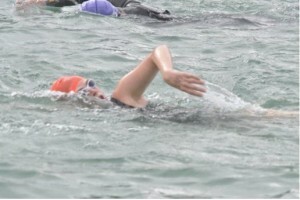 She swam to raise money for the Homeboys Foundation, raising $2050. Please consider a donation if you enjoyed her mission! Hadar Aviram’s Faculty Page at Hastings College where she is a professor of law. You probably saw the posts on Facebook and Twitter, and I thought you’d appreciate some more of the inside story. The bottom line: I had an absolute blast! It was a fascinating day. We swam under crazy conditions. 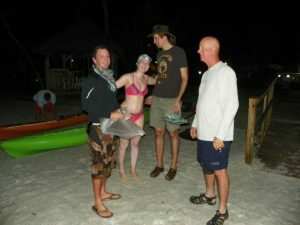 I was pulled out of the water after 11 hours of swimming and about 18 miles, in sight of the Gandy Bridge, on account of a shoulder injury (snapped biceps tendon.) Only 6 out of 18 solo swimmers, and 1 out of 3 relay teams, managed to finish the race. Three motorboats sank (sank!). There was chop, there were swells, there was a strong countercurrent that kept me swimming in place for about an hour after my shoulder gave in. More of the story: Being one of the slower people, I opted for starting an hour early, at 6am. The beginning was deceptively easy and calm. I swam in the dark with glowsticks in my cap, enjoying the delicious warm ocean water and its glassy surface. The sunrise was a spectacular sight, especially with beautiful birds flying above us and an exciting dolphin sighting. Then… we made the turn north and things changed! Conditions got incredibly exciting. Strong swells, strong chop, and crazy currents. I was able to maintain a pretty good stroke cadence, and things got easier once I figured out I should go UNDER the water every time one of the big swells came along. My crew was absolutely terrific. My kayaker, an experienced waterman and lifeguard, took the swells and chop in stride, bobbing up and down as needed. My boat captain, a humble, low-key man, left us for an hour or so to rescue passengers from one of the sunken boats (I was surprised to see strangers waving at me from my boat! It was fun!). They handled all the technical aspects really well. The shoulder started nagging after about five hours of swimming, but I pushed on. The pain became more acute after eight hours, but I pushed on. At ten hours, the shoulder as good as gave in, and the other one started nagging. My stroke remained efficient only on one side, but I body-rolled more to compensate for the compromised left wing. I sang songs in my head and told myself stories. 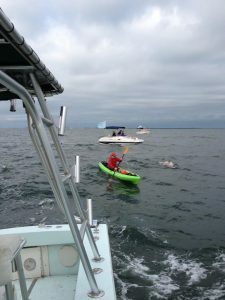 My crew seemed demoralized, and only after I was pulled out I realized it was because of the countercurrents and their concern that we would not make it. I kept seeing silver dollars passing underneath me, but I realize it wasn’t that I was making progress; they were going backwards! After about an hour in excruciating pain, which made me concerned about the potential of lasting chronic damage, I told my team that we were done. They were very supportive and kind during the ride back, which gave us all spectacular views of the rest of the course. And, we got to see a couple of playful dolphins in the water, which cheered us all to no end. I am told there was also what was described by my kayaker as a “juvenile shark”, but he tactfully did not alert me to this during the race! 1) My stroke got much smoother, more efficient, and more graceful than it ever was. 2) I shattered all my personal bests by significant margins..
3) I learned a lot about nutrition and managed to stave off all sorts of health issues. 4) I made friends with all the regular swimmers at my pool, who are actually throwing me a party this Friday. 6) I developed the ability to have self compassion and expose vulnerability and, in the process, learned that I live in the best city in the world and have a very supportive community of friends. 7) I made complete and everlasting peace with my body image. 8) I gained the respect of people for whom I have a lot of athletic respect. 9) I got dozens of Facebook and Twitter friends to follow the race and get updates, which made them all excited about the race and about marathon swimming in general. 10) And, most importantly – I raised over $2000 from friends for Homeboy Industries, a wonderful reentry nonprofit based in Los Angeles that does miracles reintegrating former gang members into their communities and helping them transform their lives. Overall, this was an incredible experience, and I am very very grateful to my family and friends, my race team, my fellow athletes, and my entire community, for their support. It really takes a village to make an average 38-year-old woman swim 18 miles through chop and swell, and I am very fortunate to have your friendship and love. As far as my future plans, I have a number of shorter races planned this season, provided that my shoulder makes a full recovery on time. I plan to spend the off-season time doing two things: Becoming a better pool swimmer, and acclimating to San Francisco bay temperatures, with an eye towards a possible Catalina Channel crossing attempt next summer for my 40th birthday.